What Does Cask Strength Mean? When I first started enjoying scotch, I was like every novice, I thought that more was better. The older the bottling, the better the scotch, right? The higher the alcohol by volume, the better the scotch, right? But like many things, older doesn’t mean better and neither does more. When whisky is made, it’s stored in casks, or barrels, for many years. This new make whisky, as it’s called, can have an alcohol content anywhere from 60%-75%, depending on distillation. It’s potent stuff. As it matures, it loses some of its potency, known as the angel’s share. When it’s removed, depending on how old it is, it can still have a fairly high percentage of alcohol. Normally distilled water is added to normalize the alcohol content to the standard bottling levels, however sometimes they normalize it at a might higher alcohol content for cask strength bottlings. For example, The Macallan Cask Strength, which has no age statement, has an alcohol by volume of 58.5%. Is cask strength better? That’s debatable. 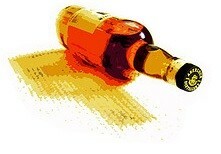 At 58.5%, the burn of alcohol overpowers many of the subtle flavors in scotch. However, some people like the idea that you can get a taste of what it’s like straight out of the barrel, before water is added to bring it down to more pedestrian alcohol by volume levels. You can adjust it to your liking, instead of accepting the more standard levels of 43% or 40%. I think it’s worth a try but unless you like your nose hairs singed off, I’d avoid getting a whole bottle. 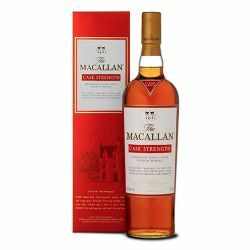 This entry was posted in Reference and tagged Cask Strength, Macallan by Jim. Bookmark the permalink. Do you mind clearing this up for me? Camille, the angels share refers to volume lost to evaporation. It goes up in the air hence the name. The overwhelming majority of the evaporate is alcohol, since alcohol evaporates at a lower temperature than water. Therefore the evaporation will reduce potency as well as volume, since the volume lost was of a higher alcohol content than the rest of the barrel. Camile’s question is better than Julio’s answer. He’s got the right idea but he over-generalizes. During maturation, a bunch of everything does indeed evaporate. In a climate like Scotland’s, the alcohol does indeed evaporate in a greater degree than the other stuff, so the barrel’s ABV typically decreases. In other climates — like the American South, I believe — the alcohol evaporate in a LESSER degree than the other stuff, so the barrel’s ABV increases. During the Napoleonic Wars, the British Navy dipped barrels of Rum in pitch (what we now would call Tar) to prevent loss of Rum by evaporation and also to make it harder for opportunist sailors to steal the contents. The term “Nelson’s Blood” originated when his body was shipped home after Trafalgar in a cask of rum & much of the (liquid) contents were drunk by sailors . My question is, has any distillery tried coating their oak casks in tar to avoid evaporation loss but still permit maturation to occur? If this could be done, it would make a marked financial improvement to the profitability of distilleries, given that whisky goes into the oak at over 90% and comes out in the high 60’s. If tar has been shown to have a pervasive flavour/taste/aroma that detracts from the natural qualities of whisky, the question remains as to whether certain products of modern chemistry might well seal a cask without intruding foreign properties. This would hult maturation. Maturation is the oxidation of the oils within the whisky. Over time as the whisky ages and the oils oxidize they change but usually only for about 25 years, after that they simply just draw more flavor from the wood and the whisky becomes more concentrated because while the alcohol and water both evaporate the oils which contain the flavors evaporate at an incredibly slower rate. Also Macallan cask strength is an amazing bottle, it dosnt burn like you would think 120 prof would and you can drink it like water. Cask strength single malt scotch whiskey is meant to be diluted with water folks, not to be drunk straight unless you want a hole in your stomach. Lots of misinformation on this by so called experts on the internet. Some bottles have directions on the rear label stating dilution is to be done 2-3 x water to whiskey. 2-3x water to whisky would be waaaay too much. I think you should add drops and try it again to see what you think. If it were 60% abv to start and you added just 1x water, that drops it to 30%… which is lower than the standard 40%. Macallan cask strength isn’t rough like others. This bottle needs no ice or water and it is loaded with flavore. It’s my all time favorite bottle. Location/climate has nothing to do with the Angels Share; it’s all about the immediate humidity and temperature the barrels are stored at. Simply, at higher humidity alcohol is lost over water, at lower humidity water is lost over alcohol. Usually a bit of both is lost. Oxygen is a big thing with flavour development as is it’s reaction with wood tannins. You might keep volume by tarring barrels but would loose other influences. Best practice to preserve volume would be to keep it all in stainless and throw in some oak staves; I’m sure this has been done in whisky. One can add O2 as wanted. Not the real way however. Cask strength is a premium market whisky usually and hence someone buying it is probably aware of dilution ratios. Drop by drop is the best practice, even diluted whisky changes incredibly with water addition. Never on ice! “Never on ice”. Sheesh, what’s with you scotch snobs and your love of telling people how to drink their beverages? Nothing finer than filling a tumbler with good quality ice, good quality scotch then ignoring it for 20 minutes until the glass is good and frosty. Try it with Glenlivet Nadurra. Best thing you’ll ever put in your mouth! I agree Jim. This “no ice” business is distressing. Please consider the plight of those living in warmer climes – the temperature of scotch in our bars is certainly a few degrees higher than say in Scotland. Allow us a little ice please! Maybe try this instead: pour yourself a finger or two and then put the glass in the freezer for 20-30 minutes. You’ll have the cool drink you’re looking for without diluting the whisky’s flavor. Mind you, the temperature change alone will mute the flavor profile (and the nose) but then you get enjoyment of the whisky “opening up” as it warms. Every sip will be slightly different, and I think you’ll find, with a quality scotch, better as you go along. I am up for correction, but I understand there to be more than one Cask Strength. 1 it is diluted to cask filling strength so that the Angels share is not too great. 2 in the barrel it generally reduces in alcohol content and the resulting aged whisky can be called cask strength. Barrelling around 63.5% maybe higher. – Stories get told about proprietary information. And then there is Heartwood that bottle above 70% ! Go Tim! Drink it as you like it as some of us enjoy it before it hits the cask. Want a free scotch gift guide? We'd like to send you our whisky lover's gift guide, which can help you find the perfect gift for the Scotch lover in your life!